Back in 1993 I can remember Benetton progressing their technical development at an impressive rate and a bunch of media talking to Tom Walkinshaw about drivers. Williams were dominant and Alain Prost was on the way to his fourth and last world title. But, before the end of the year, in Portugal, it became known that Ayrton Senna was going to be a Williams driver in '94. Prost announced his retirement but a lot of people thought it was only because he couldn't face driving alongside Ayrton again. Reigning champion Nigel Mansell, meanwhile, had gone off to the US in a huff when Frank Williams refused to pay him what he thought he was worth. He was busy winning the IndyCar crown at the first attempt - a hugely impressive accomplishment considering he'd never driven on an oval in his life. "Tom," someone said, "Will you be chasing Prost or Mansell?" Walkinshaw looked at the guy as if he'd taken leave of his senses. "Why the hell would I want Prost, Mansell or Senna when I've got Schumacher?" He said it such that if he'd called the guy a half-wit it would have been compliment. Budget may have had something to do with it and while Walkinshaw's comment might not sound odd with the benefit of hindsight, it raised an eyebrow or two at the time. Michael had taken an opportunist win at Spa in 1992 and, next day, won that very '93 Estoril race. But, internally, he was only beating Riccardo Patrese, who had been comprehensively blown away by Mansell at Williams the previous year. Although Schuey was obviously special, at that stage not everyone fully appreciated quite how special. But Walkinshaw knew. He was at races and he'd seen the testing data. He added that you sometimes have to take a bit of pain when a guy like that is inexperienced, but it doesn't last long. "You'll see ..." he said. And we duly did. Shortly afterwards Prost said that for a driver to win a championship in a close year, he can make one, maybe two mistakes. Michael, then, was making three or four. It's practically inevitable with a new driver and Prost well knew that when it stopped, Michael would be hugely formidable. 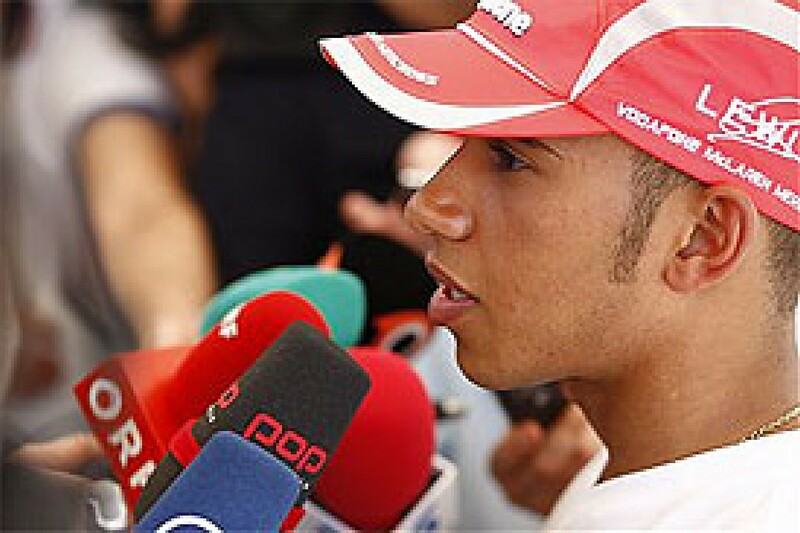 I remembered all that, post-Canada, when much of the press room was shaking its head in disbelief at how one so talented as Lewis Hamilton could throw away 10 points by driving into the back of a stationary Ferrari in the pitlane. It also brought to mind Jackie Stewart's early season observation that Lewis, still, has practically zero experience. We'd seen an error in Bahrain and here was the second in seven races. It's not a criticism. Everyone make mistakes. Lewis would be supernatural if he didn't. It's just that for a time it looked as though he might be. In China last year, ironically a few hours before the error that was to cost Hamilton the world championship, I'd been talking to Niki Lauda about the achievements of a man who everyone assumed was going to win the title. "Almost unbelievable. Truly outstanding," was Niki's assessment. "Everybody else here looks stupid, to be honest. All these guys drive for years and know everything and get blown off by this rookie coming out of nowhere. "In sport this sometimes happens. New limits are set. And he's certainly a guy who sets them. What must Raikkonen and all these other guys think? He came from GP2. It's sensational. "Don't forget that Alonso, from the speed point of view if not the political games, is the strongest guy in F1 today. And Hamilton is beating him. That, for me, is the sensation. Not that he can beat guys in cars not as quick as the McLaren but that he can beat one bloody tough cookie sitting right next to him in the same car." What about the possibility of too much, too soon? Lauda was dismissive: "It won't harm him. If the media writes nice things about him he shouldn't read it. Because in today's media you are either the king or you're the biggest idiot. There's nothing in between. It's all down to too many newspapers trying to beat each other with headlines - I know how it works! "If drivers allow themselves to be affected they either become too carried away with how good they are, or it destroys them. That's today's life and everyone has to live with it. There's nothing wrong with it and he's certainly not affected by it, because he believes in himself and works constantly to get better." Lewis's driving in Canada, up to the point he thumped the Ferrari, had been spellbinding - an exhibition of extraordinary confidence and accuracy. So what went wrong? Hamilton's engineer apparently warned him over the radio about the pit exit red light and you'd bet your life on that being so, particularly in view of Juan Pablo Montoya's McLaren disqualification for exiting the lane under a red in 2005. But these things occur in split seconds. And drivers are used to being talked to over the radio leaving the pits. Every time they leave the garage at a test they'll have someone okaying an engine map, an rpm level or a diff setting. Or even warning about a 'red light' if someone has just gone off and needs retrieving. Much of what follows they do almost on auto-pilot. That's not to say that teams bombard drivers with useless information over the airwaves in the middle of a race. They don't. But Lewis, possibly, would have been more focused on where he was going to re-emerge after the stops in a race that he had been leading comfortably prior to the Safety Car. His desire, his raw competitiveness, might have made him momentarily immune to radio advice for that nano-second after which it was too late. That's all experience, and you can't buy it. Drivers have to learn to focus on what's important. Even Schumacher. Given the amount of testing done in the modern era, Hamilton's experience bank is probably at a similar level now to Michael's in 1993 when he was a very different animal to what he came to be and to the way in which he is generally perceived. Back then, believe it or not, Michael wasn't that keen on testing the car. He had huge confidence in his ability and thought it wasn't going to get better by testing, so someone else could do that. Benetton therefore did much of their testing with Alex Zanardi, and on some of the days that he did show up, Michael would arrive a bit late because he didn't want to waste time flying out the day before. By 3pm he'd be enquiring what was left on the job list because he wanted to be away to catch a flight home. They also discovered that they probably learned as much, if not more, with Zanardi. And that was because Michael was so damned good. Give him an imbalance and he'd just alter his line, drive around it and still get the same time out of the car. Which is great, but not that helpful when you're trying to improve the car. The ultimate example of that was Barcelona '94 when he got stuck in fifth gear most of the race and still finished second. At the hairpins, instead of braking, turning in, apexing, and accelerating out in second gear, he took a great big arc around the outside of the slow stuff in fifth gear and was pretty much as quick. Looking at the data post-race, Ross Brawn, Pat Symonds and the lads were astounded. But it didn't take long for Schumacher to realise that application was just as important as god-given talent. The team were doing a lot of active ride development, indisputably worth time, and Schumacher didn't like to race something he hadn't tried. Delays cost results, and that was proof enough for him. A few years later I can remember having to wait until almost 9pm to interview him one Tuesday evening as he pounded a Ferrari around Mugello until the light had gone.